To be completed by the sender of the goods. found on the label supplied at the time of booking your order. 2) Please specify the date of collection. or a reference used between you and the recipient of your shipment. 4) Indicate the invoice number and date of invoice (if applicable to your goods/sale). VAT registered, please supply this if known. sure you are able to verify if this is the reason for import/export if needed. delivery details please specify here otherwise leave blank. 100% cotton solid dress shirts. If possible please provide the tariff code. E.g. Parcel2Go cannot obtain these for you. 11) Please specify the number of each product you have. E.g. 5 shirts 2 pairs of shoes. 12) Please specify the value of each item. E.g. the value of each individual shirt. 14) Please specify the Incoterm. This is not required but please specify if known..
advice on this, so please leave blank if you are not sure. in dollars please specify which: USA, Canadian, etc. 16) Indicate the cost of transportation charges including insurance. 17) Indicate the total invoice value, e.g. merchandise, shipping and insurance cost. 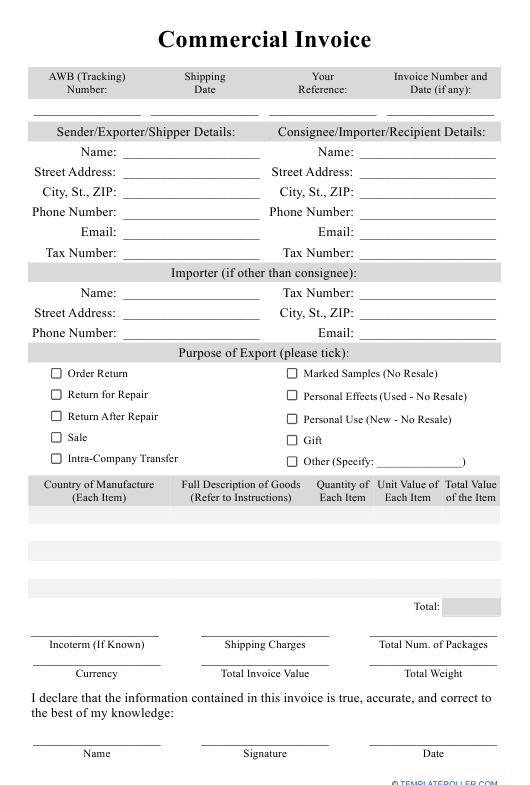 18) Please indicate how many parcels you are sending included in this commercial invoice. 19) Indicate the total weight of your shipment. Please ensure this is in KG.